Monday was a good day. The past two Mondays have been for that matter. 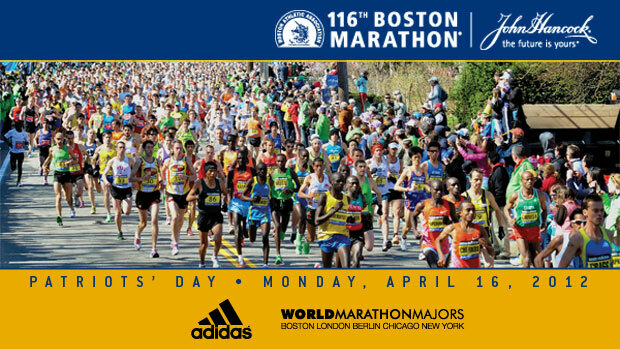 Last Monday, I was able to register for the 2012 Boston Marathon. I was a little worried that my hobbled 3:05:22 from Chicago 2010 wasn't going to be good enough to even get to the Monday open qualifier registration cattle call. I was a little mad initally that I didn't get to register with the 5+ minutes group, as my time was over 5 minutes better than the 3:10:59 open qualifier, but the seconds didn't count for registration purposes. So my BQ with 5:37 to spare was now a BQ with a 4:38 cushion. 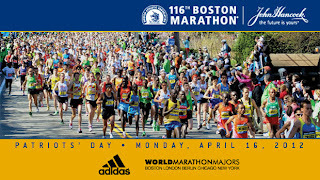 No matter though, as this Monday, I got the email from BAA stating: ‎"This is to notify you that your entry into The Boston Marathon on Monday, April 16, 2012 has been accepted." Sweet Relief! Even though I haven't run in 10 days and haven't really been right in 17 months, it felt good to get in. 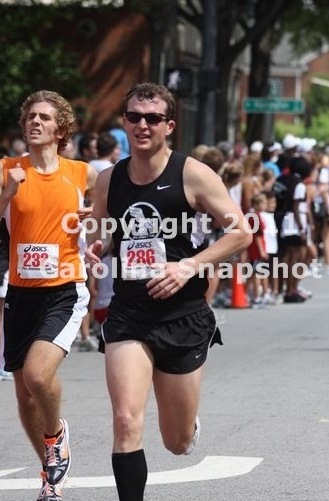 The cutoff ended up being 3:08:46 for the open division, 2:13 under the qualifying standard. I feel bad for those first timers that didn't make it. Two of my Raleigh teammates and training partners were already in (Erin Dillon and John Simons), my Greenville training partner was in (Tyler Pake) and many of my other friends and competitors were as well. 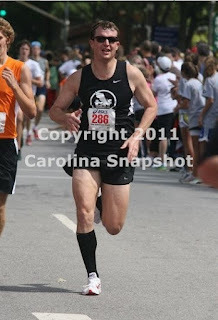 After missing last year with injury, I am primed to get healthy and improve on my 2:55:04 from Boston 2010. 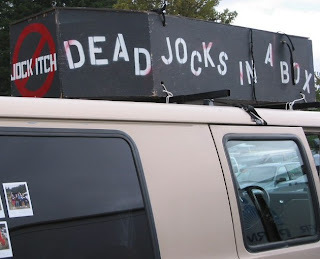 Right now, I am in the middle of a 3-4 week full running layoff to get the shins right and ready for a good long buildup. 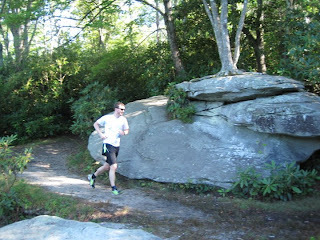 I know now not to take my running health for granted, as when you're hurt, it's no fun. One thing I didn't expect to see was good ole Kip Litton's name on the entrants page. It truly amazes me how much traffic my piece on Kip gets every single day. I wrote it over 8 months ago and some days it still gets read over 100 times. People are truly fascinated with this character. 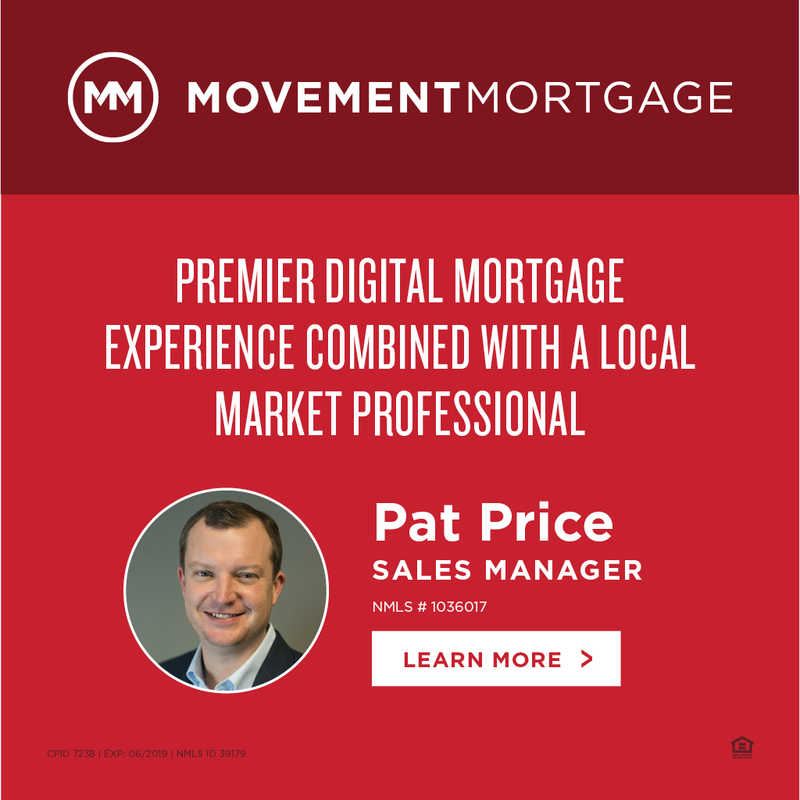 I really hope I get to meet him at Boston and thank him for all of the traffic he's generated for the site. Even better, it looks as though the time he registered with was at the Thunder Road Marathon in Charlotte, NC, my hometown. Let's hope someone keeps a watch on him! Anyways, I can't wait to get back to Boston, and... the Let's Run Message Board Thread on Kip Litton is now up to 88 pages if you want to follow the always developing saga! Onwards and upwards! 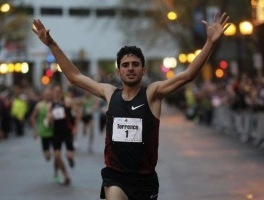 David Torrence is as close to the king of the road mile as you're gonna get. The three-time consecutive USATF Road Mile Champ will have his hands full this weekend at the season ending Fifth Avenue Mile in New York, NY. 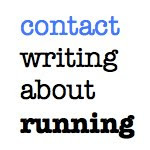 Torrence rose to cult fame with his now famous downhill sub-4 attempt thread on LetsRun.com that he took video of (see video below). Just last weekend, Torrence won the Front Street Mile in Maui, in a course record of 3:57, but didn't have to face Bernard Lagat and the boys. He will Saturday at 1:05pm eastern. Along with Lagat, there's a huge field that will fight for the win down on one of Manhattan's biggest streets. Joining the fun on the American side is new pro, AJ Acosta, Steepler/Jack of All Distances, Ben Bruce, Saucony's Garrett Heath, 32-year old Sub-4 man, Christian Hesch, the sometimes mustachioed Will Leer, New Balance's Craig Miller, Nike's Kyle Miller, former Buckeye Jeff See, US 800 champ Nick Symmonds and the resurging Fam, Anthony Famiglietti. Defending champ, Amine Laalou, leads the international competition, with Australia's Jeff Riseley throwing his hat in the ring. Morgan Uceny will be the favorite on the Women's side, as she looks to be the first #1 World ranked American Woman in the 1500 in many, many years. 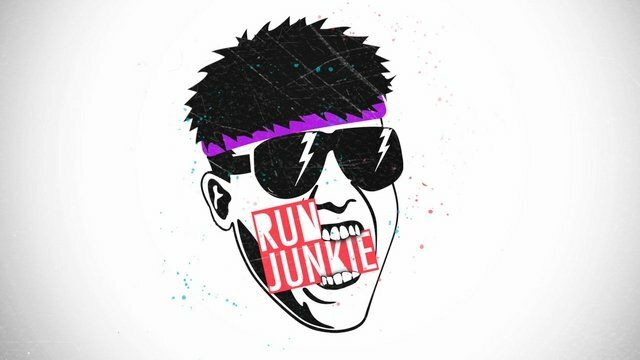 The Women's race will go off at 12:50pm and also includes Brooks' Gabrielle Anderson, Road Mile Champ, Sara Hall, multiple time US 1500 Champ, Shannon Rowbury, 2011 World Champ Jenny Simpson and 800 meter specialists, Alysia Montano and Maggie Vessey. World Championship Silver Medalist, Hannah England, leads the international challengers. 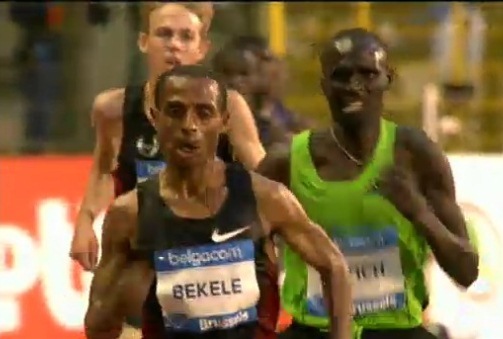 Somewhere in the middle is OTC's Sally Kipyego, who took Silver for Kenya at 10,000 in Daegu. She, along with a large field of other international competitors, will make for an exciting race. New York Road Runners TV will show highlights at 8pm. 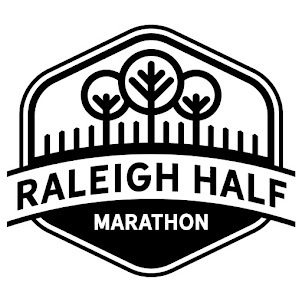 Full race schedules are available here. It's been a while since Anthony Famiglietti has competed. What better place to return than one where he has won before? 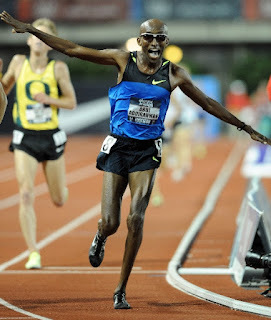 Fam won the 2008 USATF Road 5k Championships and will start his drive towards qualifying for a third consecutive Olympic team with another run through the streets of Providence, RI tomorrow, in search of another National Championship at the CVS Caremark Downtown 5k. He's written a blog post about his return as well. Fam's recently been training in Davidson, NC (right outside of Charlotte) and recently returned to the roads with a tune-up win at the Sunset 5k in Salisbury. Fam also attended Appalachian State for two years (before transferring to Tennessee) and leads a charge of runners with NC ties at Providence. 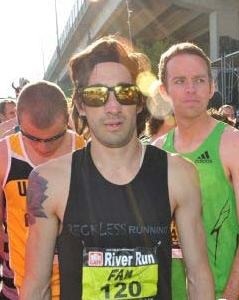 USATF 8k Champion, Bobby Mack, will be among the favorites as he continues to have a breakout season. My friend, Sandy Roberts, will be making his USA Running Circuit debut. 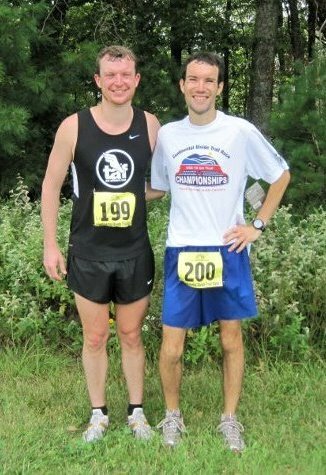 Both Mack and Roberts run for The Athlete's Foot Racing, out of Raleigh, NC (my team). Also out of Raleigh is Duke Law student, Lauren Bonds. Bonds has had a great past few years and will be representing Adidas Raleigh TC. All will be skipping out on the Mag Mile tomorrow (NC USATF Road Mile Championship in which Mack is a multiple time winner). Finaly, Stephanie "Pezz" Pezzullo, trained in Charlotte for a while, before relocating to Flagstaff, AZ. Robert Cheseret, who is Bernard Lagat's brother, will be defending on the Men's side, as he kicked down Ben Bruce last year in the final steps to take the National Championship. An excellent field will challenge for the win, as many have traveled to Providence for the shot at the $30,000 purse. 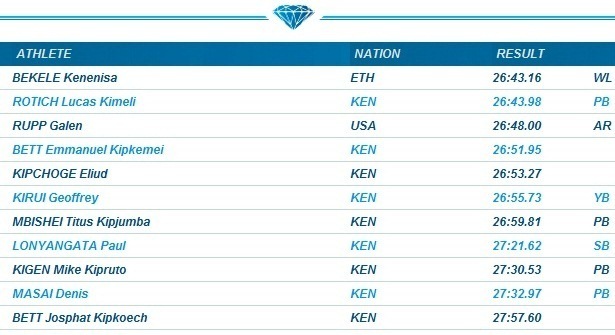 Aaron Braun and Ben True will be favorites, along with Fam, Mack and Cheseret, as Braun is currently 1st in the overall USA Running Circuit standings with True a close second. 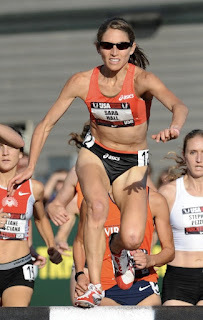 Sara Hall will look to improve on her second place performance from 2010 on the Women's side, and has a Fam connection as well, as she's spent some time with him working on her steeplechase technique. 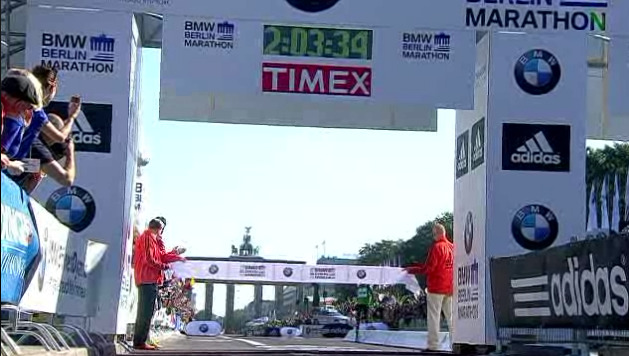 She'll likely choose that event to try to qualify for the 2012 London team. 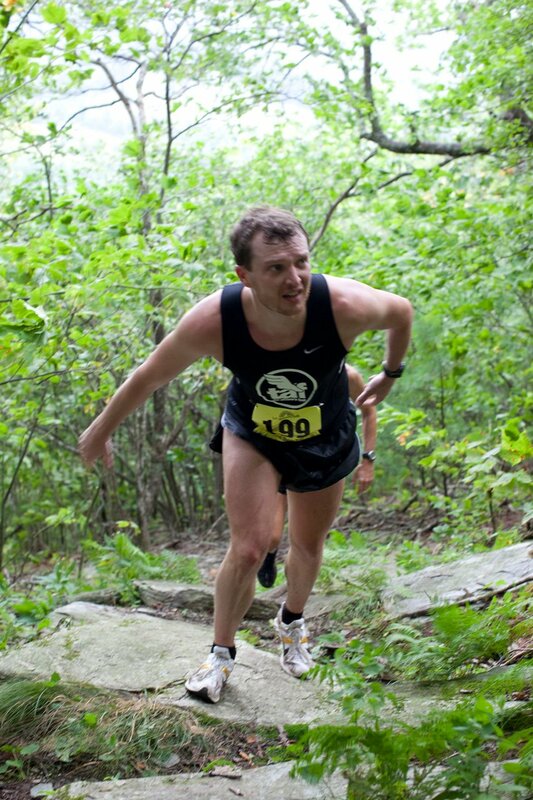 Hall is currently ranked fifth in the USA Running Circuit standings and could make a big jump with a win in Providence. An injured Molly Huddle won't be defending her title, but Hall will get plenty of competition from the likes of Julie Culley, Emily Brown, Pezz, Bonds and a strong field from all over. 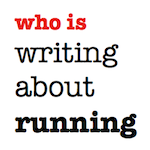 If the Runnerspace race coverage team team remains the same, Chris Nickinson will have the call on the Women's side. Maggie Vessey got things started in the night session of Day 7 at Daegu by running a near perfect race in the semis of the Women's 800. Vessey glided by Great Britain's Jenny Meadows in the final meters to secure a spot in the final and thus eliminating Meadows, a medal favorite in the process. 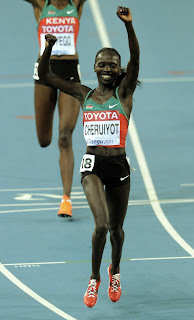 Her time was a quick 1:58.98 and was the slowest of the 8 qualifiers for the final. Alysia Montano sprinted into the final as well with one of the two time qualifiers. The other non-auto qualifier was Jamaica's Kenia Sinclair, another favorite. The final is going to be a good one, but watch out for Caster Semenya. As I mentioned on Twitter this morning, it looks like she's been sandbagging. Her final 200 in the semis was lightning fast. If she unleashes something like that in the finals, it will be a fight for Silver. The Women's 5000 was a hard fought battle between the Kenyans and Ethiopians, specifically the eventual winner, Vivian Cheruiyot, her teammate, Sylvia Kibet (Silver) and Ethiopia's Meseret Defar (Bronze). The only competitor to break up the Kenya/Ethiopia dual meet was our own Lauren Fleshman, who dug deep and kicked down Ethiopia's Genzebe Dibaba in the final steps, for a very respectable 7th in 15:09.25 (one place better than she finished at USA's). 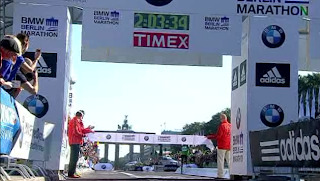 Amy Hastings didn't have it today, but for a marathoner to even make the 5000 Final at Worlds is quite the accomplishment. In the sprints, Usain Bolt, Walter Dix and Christophe Lemaitre look like the medal favorites in the 200, where Veronica Campbell Brown took Gold in the Women's 200 Final, with Carmelita Jeter taking Silver and Allyson Felix taking Bronze. The Men's 4x400 Relay had to work for it, but in the end, LaShawn Merritt used a miler's sit and kick tactics and powered home on the last straightaway to secure the American Gold. Day 8 has the Men's 50k Race Walk in the morning and then gets fired up on the Track at night (or the early morning Stateside). The fun starts at 7:15am eastern with the Men's 1500. 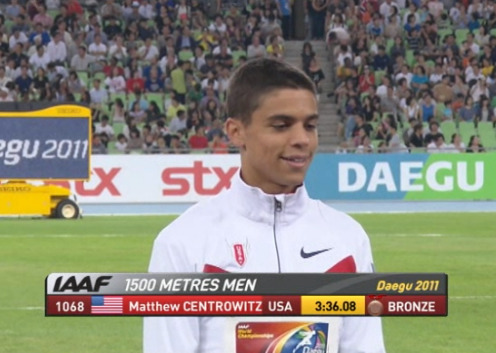 Matt Centrowitz has surprised with his calm and veteran-like demeanor in qualifying for his first World Final. Should we really be that surprised though? Centro has proved to be an excellent rounds and tactical race runner. The final should see how good he really is. 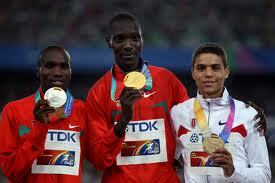 A medal shouldn't be out of the question, and at minimum, he should be there in the mix with 200 to go. 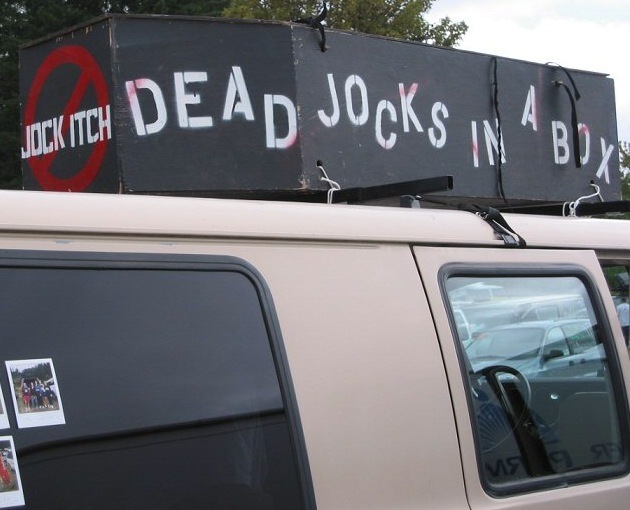 He'll have quite the competition, with Kenyan favorites Asbel Kiprop ('08 Olympic Gold Medalist) and Silas Kiplagat ('11 World Leader), as well as Nick Willis ('08 Silver Medalist), Mehdi Baala ('08 Bronze Medalist), plus many others, including the most improved, and most beloved, "Bullet with the Mullet," Ireland's (via Florida State) Ciaran O'Lionaird. Check out Flotrack's prediction contest as well. Closing out Day 8 will be three sprint races. The first is Women's 4x400 Relay at 7:40am. Can they match the Men's Gold? Next up is the Women's 100 hurdles at 8:00am, where they have to run the semis 1:45 beforehand. 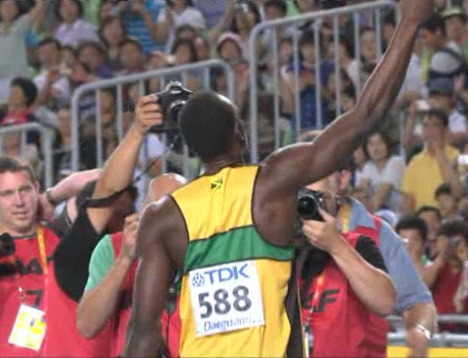 Closing out the day at 8:20am will be Mr. Bolt vs. the World in the Men's 200 final. Walter Dix looked great in the semis, but can he stay within a few tenths of the king? We'll see. He may not have to if Bolt "false starts" again. Follow along at Universal Sports! Who woulda thunk it? Jenny B. Simpson ran a near perfect race to take the Gold Medal in the Women's 1500 at the 2011 IAAF World Track and Field Championships today and has never looked better. Unlike the semi, she bode her time, worked her way through the pack smoothly, and slowly changed gears starting around 250 to go. Only 250 before that, she navigated her way through the massive pileup that claimed Morgan Uceny's chances at the podium. For as much as I have wanted Jenny B to go back to the Steeple, I couldn't be happier. When you have a Gold Medal, you can do what you want! In the night session, Bernard Lagat and Galen Rupp looked great in the 5000 semis. 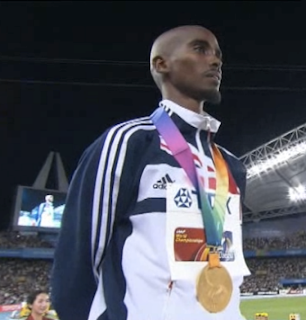 Both should make some noise in the final, with Lagat being one of the favorites, with England's Mo Farah. All three Americans looked great in the Women's 800 prelims and advanced automatically to the semis as well. In the 1500 semis, Matt Centrowitz ran perfectly to win the first heat, without exerting too much energy. He didn't get off the inside rail for much of the race and stuck when necessary. He has had an incredible year so far, winning NCAA's, USA's and now truly being in contention for a medal in the finals. He'll have his hands full with Asbel Kiprop, Silas Kiplagat, Nick Willis and others, but many strong contenders were bounced, including Leo Manzano, who looked to have pulled something with about 50 to go. The Men's Steeple went almost to plan with Ezekiel Kimboi winning and dancing it out, leaving teammate Brimin Kipruto the Silver and France's Mahiedine Mekhissi-Benabbad the Bronze (over countryman Bob Tahri). After this, Broughton High alum, Jesse Williams struck Gold in the High Jump and Lashinda Demus got equal Gold in the 400 Hurdles. Day 7 is a little light on distance events, but does have the Alice Schmidt, Maggie Vessey and Alysia Montano in the Women's 800 semis at 6:25am Eastern Friday morning, as well as the Women's 5000 Final at 7:25am. Amy Hastings and Lauren Fleshman will take aim at a strong field with high hopes! Check out the action on Universal Sports!